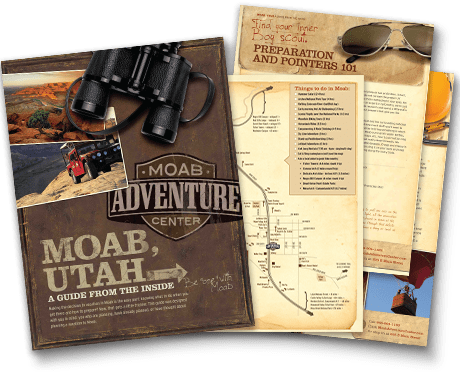 Experience the excitement of 4 hours in the heart of Moab's famous redrock. 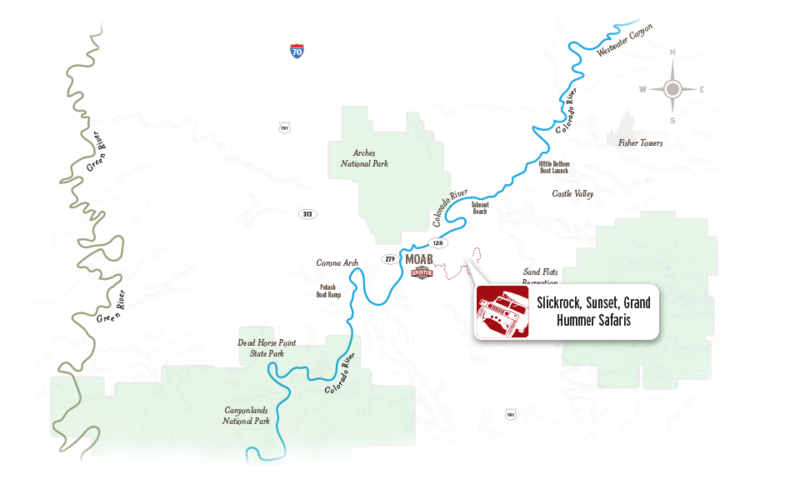 Longer than the Slickrock Safari, this 4-hour trip offers additional incredible views and exciting terrain. You’ll experience first hand several remote geologic wonders and savor breathtaking vistas into both the Colorado River valley and the Moab valley that will leave you with an incredible feeling of awe and some amazing photos. 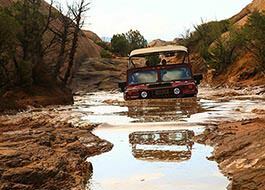 With at least 6 people in your group, you can also customize the 4-hour safari to explore one of several specific 4x4 trails in Moab. 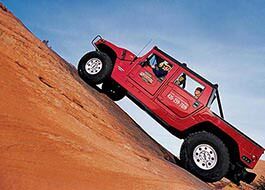 Hummer Safari trips meet at the Moab Adventure Center, 15 minutes prior to schedule departure. Trip is 4 hours. 16 inches of ground clearance all the H1 to render countless obstacles neutral, be it a large sandstone rock or a fallen tree. The H1 can ford 30 inches of water. That's 2 1/2 feet. This kind of depth is achieved with a sealed central venting system, protecting major drive train components from contamination. The Hummer H1 has an approach angle of 72 degrees, departure angle of 37.5 degrees and a break over angle of 32.5 degrees, all allowing the h1 to pass through deep ditches and traverse large dirt mounds without suffering any front or rear end damage. The H1 can scale a 60 degree slope. The Hummer H1 has 17 inch high-strength cast aluminum wheels with tire bead retaining system. Air compressors deflate or inflate each tire for maximum grip. Fitted on these wheels are 37 inch tires that climb just about anything in our path. 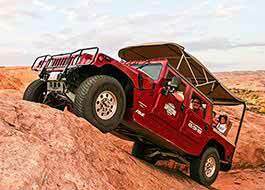 We had an amazing experience on the Hummer Grand Safari. Erik, our guide and driver, was the best! He made the trip very enjoyable. We enjoyed learning about the history, animal and plant life of the area. I would definitely recommend this trip to anyone planning on visiting the Moab area. The Hummer ride was so much fun. We were so last minute and you saw to our request and were able to accommodate. The guides on the Hummer Grand Safari were both so upbeat and interacted well with our group. The guides were very patient with our group getting delayed and did not seem put off by the situation. Great guys! 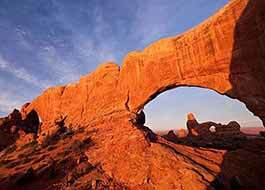 Explore amazing arches and chasms in Arches National Park! Take this scenic bus tour and enjoy guided hikes to all the best sights. 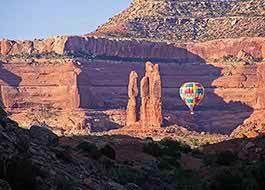 Soar over the sandstone valleys and spires of Moab from the unforgettable perspective and ride of a hot air balloon. Departure Times: Times vary depending on sunrise. Rated "The West's Best Short Whitewater Trip." 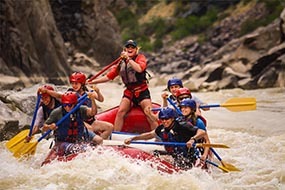 Experience narrow canyons, rushing whitewater and distinctive geology.